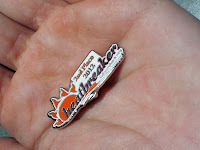 My Heatbreaker Half age group award! This is different: it's not a medal, it's a pin. At first, I was annoyed, but now, I think it's brilliant. I already have a medal, so I just affixed this to the ribbon on the medal and have a singular representation of this race. Very smart, indeed. That is an awesome idea for an age group award!